The increasing complexity of the marketing process grows the number of marketing technologies within a company. Thus a marketer needs use a variety of different tools to execute, analyze and continuously improve his marketing strategy ‒ throughout the entire customer lifecycle. But a marketing technology stack only unfolds its full potential if the individual tools in the stack can interact and are tuned to each other. With BrandMaker Fusion you can connect our MRM platform with the rest of your marketing technologies. Say goodbye to isolated operations within individual tools and create real added value for your marketing. Leverage adaptive integrations with a variety of applications to automate data exchange. Create custom integrations that are ready to go with just a few clicks. A manual data exchange, in which the transfer must be carried out by your employees, seriously hampers your workflows. 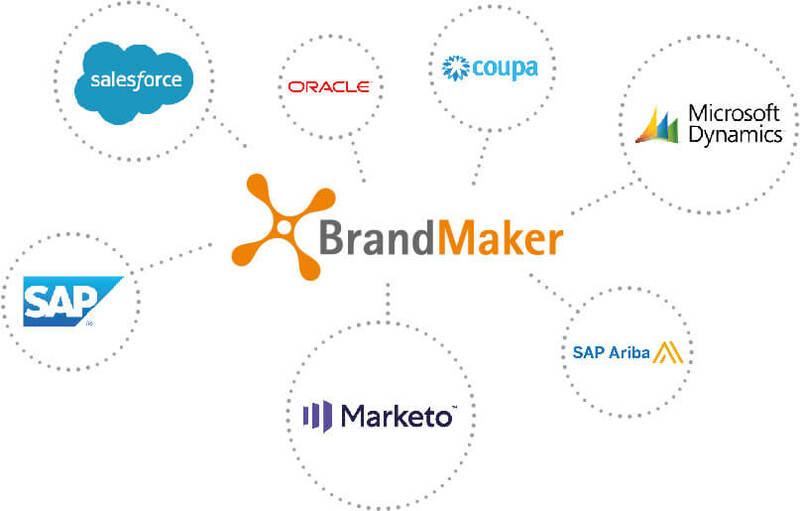 BrandMaker Fusion counteracts this and automates the exchange between our MRM platform and your other applications. To give one example: You can connect our software with your existing financial systems, which are already deeply integrated into your daily work. No overwriting of files, no manual input errors. You always have all necessary data available correctly and consistently. Generate meaningful reports and analyses on the basis of system-wide, uniform data – with just the touch of a button and in real time. No central system can function meaningfully in isolation. For this reason, BrandMaker has developed first-class integrations for a variety of other software components in the area of enterprise management. Standardized, field-proven interfaces enable us to implement customer-specific system integrations according to your use cases. You can connect BrandMaker directly to over 1,000 other applications – with just a few clicks! With Zapier you can create your own ready-to-use automations to your desired integrations and apps. To give an example, you can easily standardize and automate the transfer of contacts and reports from the BrandMaker Sales Enablement Workbench to Salesforce. Of course, our experienced consultants will be happy to support you with your individual integration requirements.